after months and months of not buying any shoes, I’m suddenly on a new kicks-spree. good thing these three are all quite affordable. for dress shoes like pumps and heels, I usually buy leather shoes, both for durability and for the fact that synthetic materials don’t let your feet breathe. these two pumps from asos are exceptions. they just fit my feet too well to pass up. bonus: the heel height is a perfect-for-me 3″. kudos to those of you who can manage to stand in 4″ heels for hours; you’re made of sterner stuff than I. 3.5″ without a platform is about as high as I can tolerate these days, and for situations where I know I have to stand or walk in heels for over 4 hours, I prefer to top things off at 3″. these two pumps are actually the first heels I’ve bought in close to a year. I’ve become a complete flat/low-to-mid heel convert. maybe it’s just me getting old, but even though I may make cow eyes at the 5″ pairs, it’s their 3″ and lower cousins that come home with me 9 times out of 10 these days. 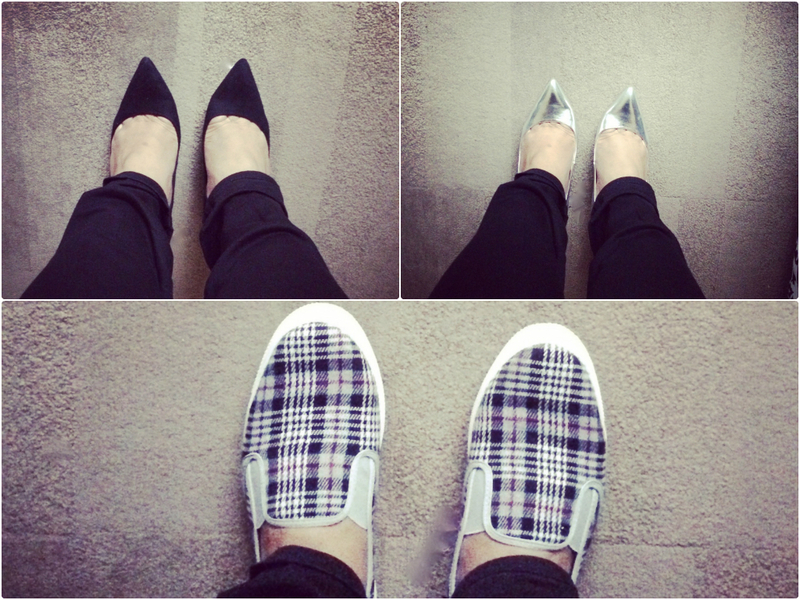 these tartan slip-on sneakers are from topshop. insanely comfortable, they go with my almost daily uniform of nice top + black jeans and I’m loving that they’re so darn easy to slip on. perfect for days when I’m running out the door (aka every day). the slip-on sneaker trend is one I’m fully on board with for spring. bonus: when fashion moves on in the next season, you’ll be left with a comfortable pair of shoes. win win.